What does the future hold for Alex, Valerie, and Laura? Has the Casual TV show been cancelled or renewed for a fourth season on Hulu? The television vulture is watching all the latest TV cancellation and renewal news, so this page is the place to track the status of Casual season four. Bookmark it, or subscribe for the latest updates. Remember, the television vulture is watching your shows. Are you? Streaming on the Hulu paid subscription platform, Casual stars Tommy Dewey, Michaela Watkins, Tara Lynne Barr, Nyasha Hatendi, Julie Berman, and Katie Aselton. A dysfunctional family sitcom, the Casual TV show centers on Alex Cole (Dewey), founder of online dating site Snooger.com, his therapist sister Valerie Meyers (Watkins), and her teenaged daughter, Laura (Barr). After Valerie’s husband, Drew (Orth), leaves her for a younger woman, she and Laura move in with Alex, who has been struggling with depression. Together, they try to help each other navigate modern dating, both online and off. On October 19, 2017, Casual was renewed for a fourth and final season, which will debut on July 31, 2018. Will it return, someday? Stay tuned for further updates. Because Nielsen doesn’t track the streaming platform ratings, it’s hard to gauge the performance of TV shows like Casual, unless Hulu decides to publicize its success. However, we do know that the show receives good reviews, and it has made it this far. 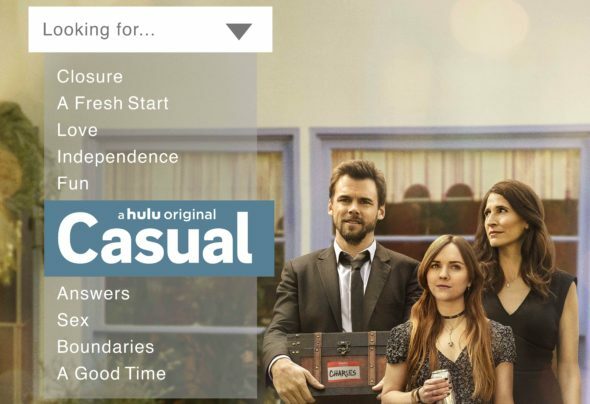 While I’m flying blind here, I think Hulu is more likely to renew Casual for season four, than it is to cancel it. I’ll keep my eye on the comedy and update this page when any news breaks. Subscribe for free updates on all Casual cancellation and renewal news. 10/19/2017 update: Casual has been renewed for a fourth and final season on Hulu. Details here. Find more Casual TV series news or other Hulu TV show news. What do you think? How do you feel about Hulu renewing Casual for a fourth and final season? Is it ending at the right time, or should Hulu have renewed it for season five? Let us know, below. More about: Casual, Casual: canceled or renewed?, Casual: ratings, Hulu TV shows: canceled or renewed? I just found Casual on Hulu and have been binge watching it. I LOVE it and can’t wait to see Season 4 but will be extremely sad when it is over. I think it’s one of those shows that I could watch forever. Casual is ace and think it could easily go to a 6th series. Love the dysfunctional theme and the actors are all great. I hope it keeps going, this show is almost everything and it gets better literally every single episode. HULU if your reading this… You have to come with a seasons 4-6 at least! This show is real , its funny, its raunchy and people can relates to one or more of the situations. It’s a great show that’s gotten better and better. I hope it keeps going. I’m hooked on Casual, I binged watched all three seasons, please make another season. One of the best, yet raunchy, shows I’ve seen in a long time. It has characters that are real yet oddly annoying, maddening and likeable at the same time. I’ve enjoyed 3 seasons of casual and look forward to seeing many more. Love watching casual, it’s funny, but yet personal. I’ve enjoyed all 3 seasons and look forward to many more to come. I hope there’s many more seasons of Hulu’s Casual I love it! !